Notes: 3 Screens - Special thanks to Harry Mohney and Curt Peterson for info and pics. The Friends of the Bohm Theatre are working hard to reopen the the Bohm in time for its 85th Anniversary, in Dec. 2014. You can help by voting for us on Facebook throuh the State Farm Neighborhood Assist Grant Program. We can win $25,000. Voting takes place April 4 - April 22, 2013. Go to the State Farm Neighborhood Assist App on Facebook, select Michigan from the drop down, then Bohm Theatre Restoration. Thank you!. I spoke with a Denise Parker with the Albion Community Foundation today regarding the possibility of renting the Bohm for a special event. She informed me that the theater is closed for restoration, but it should be ready to open within the year. She invited me to call her this coming spring. So something positive may happen with this Albion jewel. Hope so. The Bohm is now closed. It closed over the past winter. From what I have heard, the present owners let the grant to fix it''s leaks fall through and the electricity has been turned off in the building. This has led to water backing up in the basements, as the sub-pumps are no longer working and the basement is at or below the level of the river. It looks like a long closure is probably on hand for this little gem. It makes me sad to see it so. 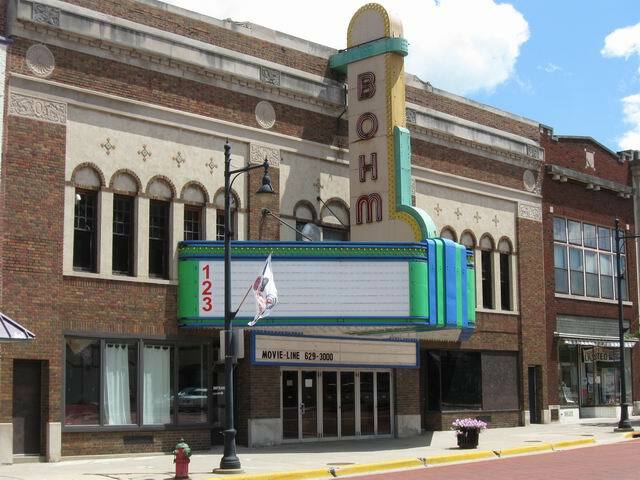 The Bohm Theatre is open and well- it''s new name is Bohm Cinemas and it has a website: http://www. bohmcinemas. com/. The matinee price is 3. 50USD any time before 6. 00pm and it is regularly priced at 5. 50USD, except for under 12 and senior tickets, which are also priced at 3. 50USD. as of just a few days ago, the bohm theater has once again closed, for reasons i am not sure of. it feels wierd looking out my front buisness window at night, and seeing all the lights off. 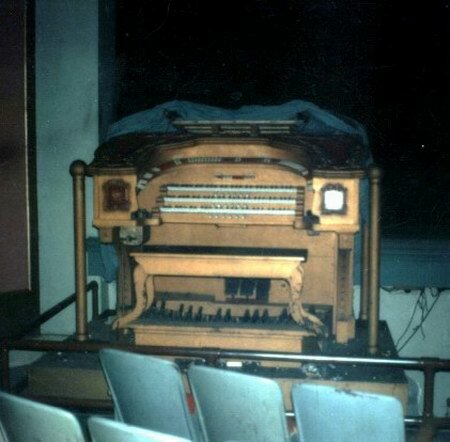 This is a photo of the 8 rank Barton pipe organ that was installed just before talkies came out. 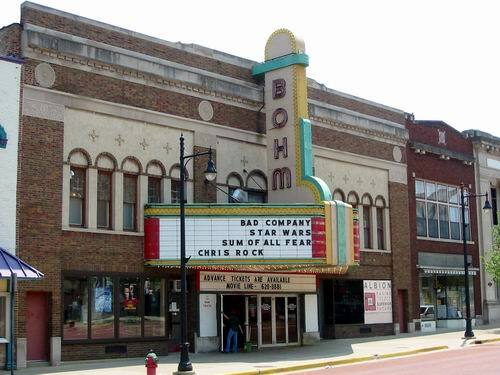 The Bohm opened Christmas eve 1929. One of the first cantilever balconeys in central Michigan. George A. Bohm, builder, owner and manager of Bohm Theatre, was born in Albion; resides with his mother, Mrs. Lena Bohm, at 402 Crandall Street; has been in the picture business 17 years. He is a talented musician; playing both clarinet and saxophone. As a member of Sousa’s Band toured the United States, and during the World War, this band was enlisted in the service as one of the U.
S. Navy Bands. Mr. Bohm was a member of a specially organized band which accompanied President Wilson on his first peace trip to Europe after the armistice was signed, and has had a rich band, orchestral, and theatrical experience. He played in several theatrical orchestras in leading playhouses where Maude Adams, Cauncey Olcott and many other celebrities appeared. Mr. Bohm’s boyhood dream of having a picture show business of his own was stimulated by his orchestral experience. In 1915 he started a picture show on West Porter Street, later he operated the Censor Theatre until his new theatre building was completed and formally opened to the public, December 25, 1929. Bohm Theatre has an attractive entrance, is a substantial, two-story brick building, with two store spaces in front; has a large three-manual pipe organ; spacious stage; excellent acoustics; very latest type of talking equipment. Its owner endeavors at all time to please his patrons in selection of pictures and in consideration of their personal comfort. BOHM THEATRE DATES BACK TO WORLD WAR I ERA by Frank Passic, Albion Historian Albion Recorder, May 19, 1997, pg. 4 Downtown Albion has seen numerous improvements during the past several years which have helped bring new life to our central business district. One of these is the reopening and remodeling of the 1,100-seat Bohm Theatre at 201 S. Superior St. 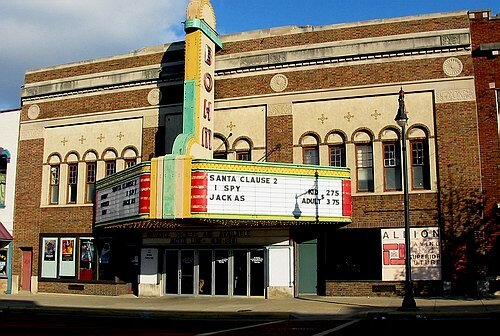 The Bohm Theatre has been a major downtown fixture since it opened on Christmas Day, 1929. But did you know that this was not the first Bohm Theatre in town? George A. Bohm (1890-1951) was born and raised in Albion, and became quite an accomplished musician. During World War I he joined the Navy and was a member of John Philip Sousa’s famous 300 piece band as first clarinetist. He was chosen as a member of the band of the Battleship Pennsylvania, flagship of the Atlantic fleet, which sailed to France with President Wilson for the signing of the Treaty of Versailles in 1919. George’s brother Gustav (1897-1967) also played saxophone in one of Sousa’s bands. George was a member of several area orchestras, and with his siblings formed the first saxophone quartet in Southern Michigan. During the 1910s silent films were sweeping the nation and soon movie theatres were opening everywhere, including in Albion. George Bohm opened Bohm’s Theatre on the east side of the first floor of the Commercial Hotel building at 108 W.
Porter St. in 1915. 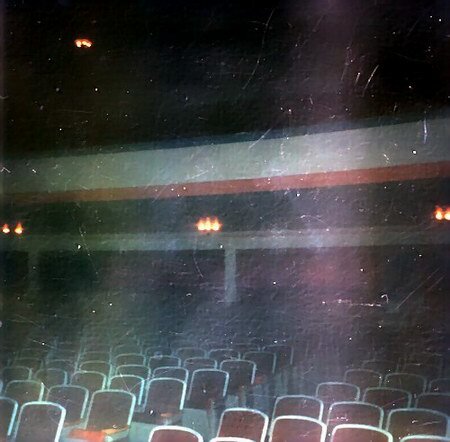 This was the first Bohm Theatre. Our photograph shows the entrance as it appeared in 1916. Notice the arched catwalk to the far right, which still exists today minus the arch bricks. Another theater, the Temple, moved to the north side of the Opera House building (223 S. Superior St. ) after the Flood of 1908. In 1914 it was purchased by building owner Hadley H. Sheldon, and renamed the Censor Theatre. George A. Bohm purchased the Censor from Sheldon in late 1916, thereby closing his W.
Porter St. operation. He then took over operating the Censor. Not wanting any competition in the local entertainment industry, the story goes that George had the fire marshall declare the Opera House upstairs a fire trap, thus ending its existence (although school plays were still held there during the 1920s). While George served in the Navy in World War I, his brother Albert Bohm (1887-1960) managed the Censor Theatre. 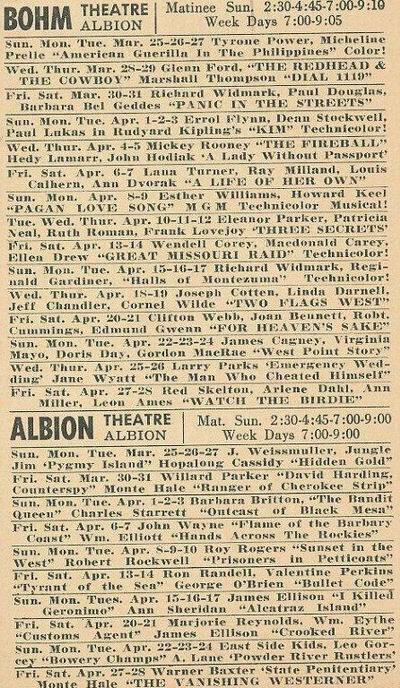 Albert continued as projectionist at the Censor and Bohm Theatres until his retirement in 1955. George continued to operate the Censor Theatre until the present Bohm Theatre was completed in December, 1929. At that time the Censor was closed. Mrs. Marian Embury served as organist at the Censor for many years. It was at the Censor that the first talkie motion picture in Albion appeared in May, 1929, The Bellamy Trial.